Released 21 September on Defected Records, ‘Defected Presents House Masters Masters At Work’ is a collection of 40 original tracks and remixes from possibly the most impressive discography in house music. Masters At Work, the ground-breaking project of Louie Vega and Kenny Dope, forged a reputation for genre-eschewing DJ sets and flawless house production throughout their careers, while their influence and reach arguably changed house music forever. Taking the distinct and already highly praised production aesthetic of Vega and fusing it with Gonzalez's encyclopaedic knowledge of breaks and hip-hop, Masters At Work created an accessible yet defiantly underground sound that is still being copied and referenced by many of today’s contemporary producers. 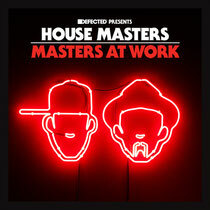 ‘House Masters Masters At Work’ is the distillation of 25 years of both genre defining and genre defying moments: hand-picked compendium of original productions and remixes set over four expansive CDs. The album digs a little deeper, and includes some of their less well-known records resulting in a collection fit for the connoisseurs. Masters At Work have always operated according to their own rules and their own sound. Whether it's the sampling techniques of hip-hop, the swing of Latin styles or the soulful euphoria of house – they've always added their own special ingredients.